BillboardXT uses Sun Microsystem’s Java technology to support various operating systems like Windows, Mac, Linux and Unix. Java Runtime Environment (JRE) 6.0 or higher is required to run BillboardXT. This is just a screenshot of a page created with BillboardXT. 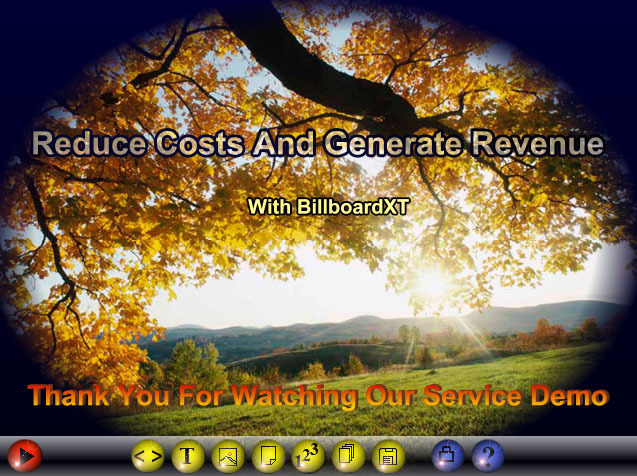 It is easy to make eye-catching art effects of text and images with BillboardXT. Add text, images and pages. Change z-order and page order. Save changes to the XtraTek web server. Check permission and so on. Add effects such as fade, zoom, move, roll, and transparency to text or images. Protect your presentation with a password. Control who can edit your presentation and which page(s) in your presentation can be edited. We design a special layout for you if you have special requirements for your online training courses or online tests.